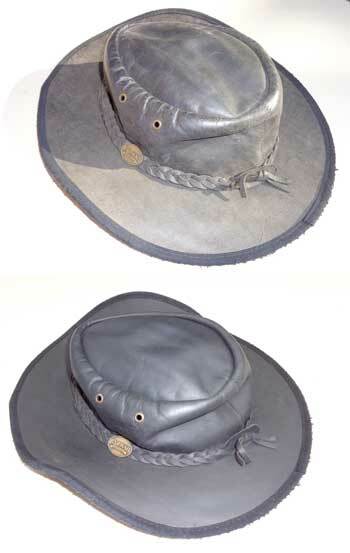 If you want to get ahead, get your leather hat restored! New zips in handbags, coats and jackets and waistcoats, and cushions. Repair of holes or tears in the upholstery in your home or vehicle, or in your clothing. Removal of ink marks made by pen to your coloured leather. Removal of dye transfer from clothing caused for example by someone sitting in their new damp jeans on your suite, or rubbing the handbag against your leg whilst walking, or the damp dog sitting on your colourful throw. Sewing of seams to clothing and upholstery using matching coloured thread specifically for use on leather. Removal of body grease or oils from your handbag handle or from the cushion on your suite. These can be caused by moisturising creams or hair gels or an accident whilst eating the takeaway and watching TV. Repairs to scuffs caused by your pet or abrasion of something in your car to the seat, or feet to the lower panels of your suite. Re-colouring of damaged surfaces and restoration of the grain pattern that happens over time as you get in and out of the car, or the arm on the chair that always seems to be rubbed against. Cleaning of soiled and stained leather, removal and making good those accidents that always seem to happen. Products for cleaning and maintenance of leather so that you can keep your leather looking and feeling good with the confidence of knowing that the product you have is the right one for the job and will not cause harm to your leather. Eradication of mould caused by storing your clothing or furniture in damp conditions.